We've introduced a reward points program when you shop at Grover Allman. You can sign up or log into your account right now and claim 200 points for free. For every dollar you spend with us, you earn 5 reward points. Once you've earned a few points, you can redeem them for discounts on future orders. We hope you enjoy your rewards. You can share via Facebook, Twitter or email by clicking the buttons below your link. 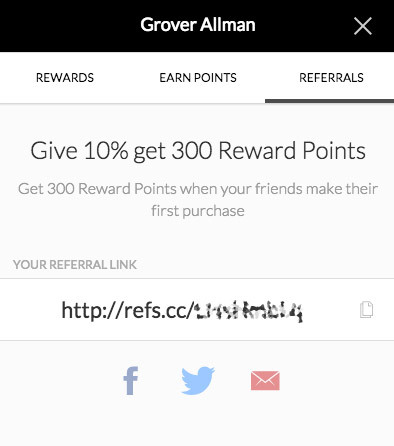 For every person who places an order using your unique referral link, you'll automatically get 300 reward points added to your account. Plus, you'll look like a great friend because they get 10% off their first order. Win-win!